I’m not the greatest cake decorator in the world but I do like to have a go. One of the things I have always been disappointed in is the way that I ice my cupcakes. This is because although I have so many types of nozzles for my piping bag, I never had one of the big ones to do the pretty swirls like everyone else. So last weekend my husband took me to out to go and buy some new nozzles for my piping bag that we have seen for pretty cheap and then I had to bake some cupcakes to decorate – just to test it out, obviously. 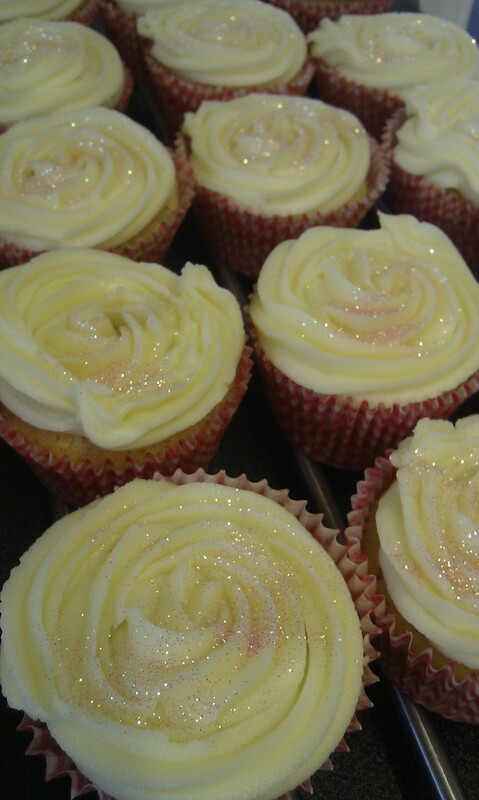 I used the recipe that I also used for my sisters cupcake wedding cake for the cakes and the buttercream icing and set about making pretty little cupcakes first thing on a bank holiday morning. Although my first couple of iced cakes had to be eaten (best way to hide the evidence of cake decorating gone wrong) I managed to get the hang of it by the end and made them look pretty swirly. Then after adding a little sprinkle of pink glitter they were ready to be taken to work. From people’s reactions to them I think they were quite impressed, though as the baker I could see all the little imperfections, they still went very quickly indeed. As I only have less than a week at work before I go onto maternity leave I will have to start planning on what to make before I go. I am thinking of some chocolate muffins, which are sturdy and easy to transport, some pretty little cupcakes with plenty of swirly icing (just because I can) and maybe a cake – possibly a sponge but it could also be quick fruit cake. I have 2 offices of staff to feed as my mom’s work colleagues are also really nice and I love visiting them, so I’m sure a delivery of cake will make them everyone happy and to say thank you for all the lovely comments and conversations I have had with people during my pregnancy.